These photographs were taken at the Christmas party around 1967 or 1968. The first photo shows from left to right Jennifer, Mrs Wright, Mrs Kendall (who was in charge), Trudie, Carol and myself Alexis Wood. The second photo shows from left to right Jenny, Jennifer, Mrs Wright, Mrs Kendall, Trudie, Carol and Liz. 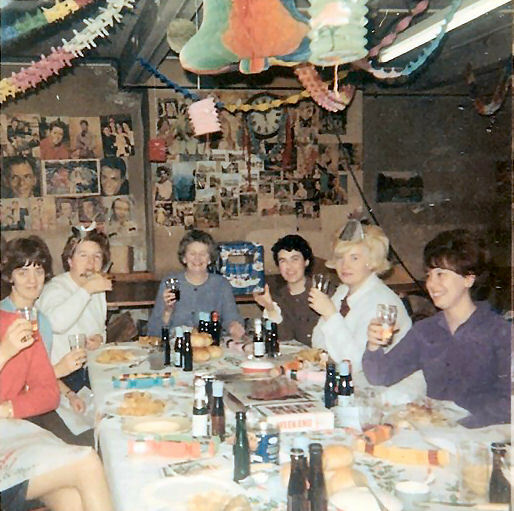 You might be interested in noting the Babycham and Pony bottles, both favourites with the ladies, on the table and pin-ups on the backwall. 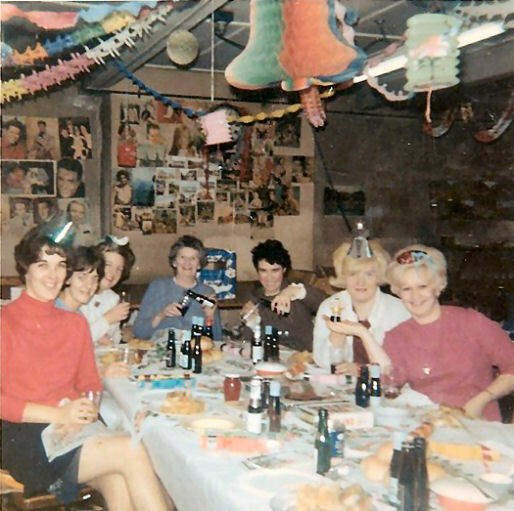 Christmas party around 1967 or 1968. Cliff was obviously popular, but I cant work out who the other “stars of the day” are? Yes how well I remember Hanningtons curtain workroom it overlooked Brighton Place. At that time mid 1960s, I was a young electrician installing some special lighting at an art restoration studio (now an Italian Restaurant) opposite the Druids Head where I parked my green Mini Car, it would be almost impossible now! The girls at the workshop would give a wave, I knew one of them quite well. Does anyone remember the Drapers Ball? It used to held at the Dome every year a lot of the staff from Hanningtons and Vokings used to attend, it was a masked ball and at some point of the evening a prize was given for the best mask then all the masks were taken off. They were good times with lots of memories. Sorry to see Hanningtons lose its old world character. I used to visit the shop with my Mum then later as I grew older with my wife. Alas these memories are all that’s left. I remember the Drapers Ball. We used to go each year as a group with friends from Plummer Rodis and Vokings. The masked ball was a great evening out. One or two members of the group were involved with carpets and the curtain section working with Hanningtons and I think Plummer’s. Does any one else remember going to this annual dance? It was at the Dome?